Silk shantung sheath dress with boned bodice featuring machine embroidery. Tiered layers are silk organza with layers of procion dyes and beaded hems. The backdrop is painted and stitched onto heavy interfacing & hung from painted wood. Goldsmiths College Embroidery Textiles, department, Stolen from Sechelt Art Centre in 1992. 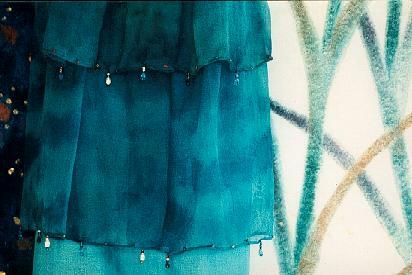 Detail showing dyed silk organza overskirt with beaded rolled hems.